Caketin – glassy or spikey? Sure does! Have a look at this! I still can’t figure out why they forced Fletchers to replace the entire cladding of the stadium last year, if they had plans to replace the entire cladding anyway. Sounds like someone was getting a little uppity in a power struggle. Anyway – it seems that Populous – the architects formerly known as HOK / Lob Sport – have been playing around with some far more exciting forms than just a circular cake-tin. 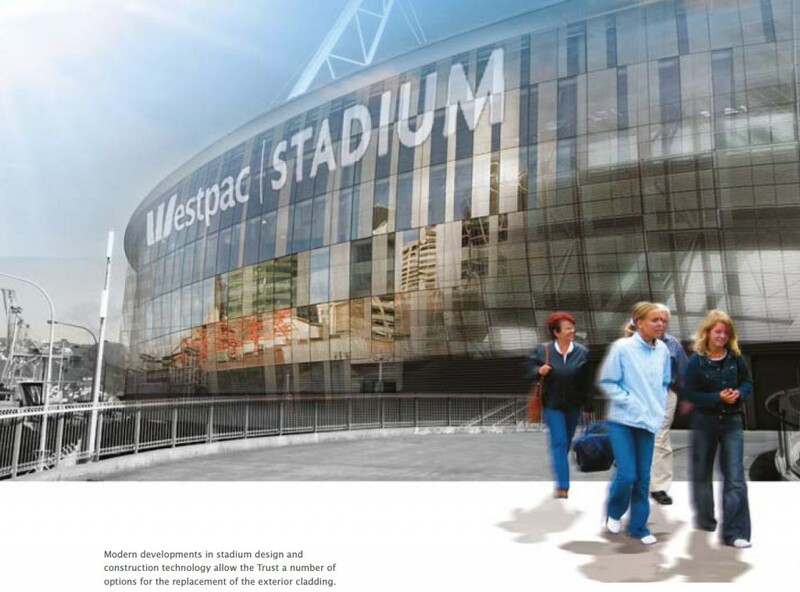 The pic above is very spikey – perhaps a real option – to make the Wellington stadium have its very own identity in the world, in a similar way that the Rock at the Airport has stamped its own mark (and no one seems to mind it now). Depending on what the cladding is made of, it could have a real effect on Wellington’s wind as well, perhaps. This second option, which appears to be glass, is likely to have an enormous cost I would have thought, compared to good old profiled zincalume profiled steel…. The inside, fortunately, is also planned to get a significant upgrade. Not before time too! Complaints about the Stadium seem to focus mainly on the quality of the food and the surroundings in which to eat. • Replace the external cladding. Which seems like a fairly comprehensive set of issues to resolve really, and all of them highly relevant! The 1000 seat dining room, an indoor arena, a roofed stadium, and a reinstated Thorndon Overbridge are not on the cards. 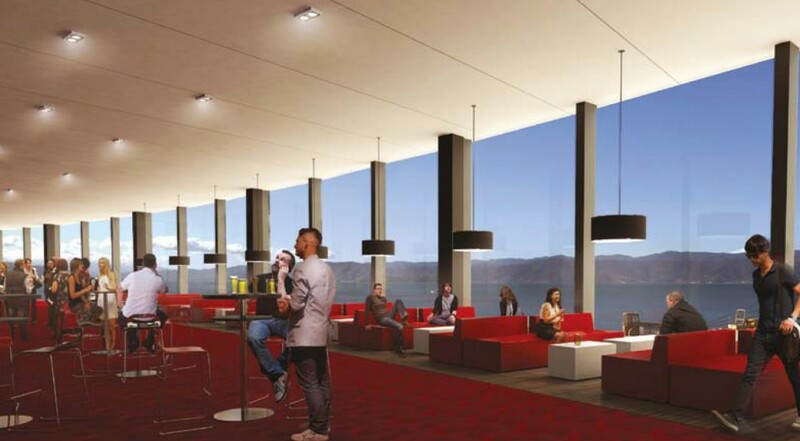 On another point completely: what progress is being made with the proposed revamp of TSB Arena, or a replacement, bigger venue? Somewhere like the Concourse of the Caketin of course? Has that gone away? Was it ever a real option to start with? Are we facing the Flight of the Concourse? While both the spiky and the Tupperware reclads have some definite positive visual plus points, it’s notable that the Aussie architects haven’t picked up on one facet of the current cladding scheme: the Te Atiawa depiction of Mt Taranaki and the accompanying taniwha either side. No doubt they have mana and meaning for at least one of the local tribes, but at the same time they must alienate others. They also celebrate maori over pakeha and pacific islanders. Plus, and probably most important of all – they look tacky and deserve to go. Not something that a sensitive kiwi architect might say however, but some brash Aussie interluder? The cladding power struggle I can’t speak to but I understood that the fixings on the cladding created a differential corrosion problem. As a general note, whilst the WCC want s/steel fixings everywhere and at all times, there is very little quality control as to the S/s coming in from China. Ask the guys at Coastal Fasteners or Anzor – they know their stuff. Alan – too tender to talk about ! 60 – Coastal Fasteners is a great little place – but they’ve moved /disappeared! Hope they haven’t folded… Yes, I understand that the cladding had faults with the fixings, and that they wanted a resolution before the 10 years was up, but given that nothing was falling off, and as they wanted a new skin anyway, it still seems petty. Incidentally, if we assume that stainless steel screw fixings were used, and therefore shouldn’t corrode, what exactly was the problem? What is the best nail / screw fixing material to fix zincalume in a coastal environment? If the experts got it wrong on this monster shed on the waters edge, what hope have the rest of the country got to get it right? Alan – I disagree, I don’t think they look tacky. Tacky would be a big Westpac or some other commercial logo. The design celebrates Māori that is true but Māori culture is for all New Zealanders, it is not at the exclusion of Pacific Islanders or Pakeha. I am a Pakeha and I feel very strongly that the Māori design elements of the stadium should be retained and if anything enhanced – it is what sets it apart from other stadiums. George – yes, but no. At present the Maori design elements are just stuck on – appliqued to the front gate – and that’s probably why they are looking tacky. If they were to be designed in as an integral part of the structure, that may make more sense…. Of course, Alan does have a point with the Taranaki maori being given precedence over other tribes – not the most sensitive thing to do, if you’re of another iwi persuasion. Ill feelings still run deep in the local iwi communities – after Te Atiawa ransacked the locals (Ngati Toa?) and drove them out / slaughtered them.